Healing Courses, Workshops and Events in the UK. We are currently developing several new areas for Healer Training. If there are no healing courses listed near you, please contact us. These workshops are to introduce you to the basics of healing. Ideal for those with no previous experience who would like to know more about the subject and try out their natural Healing ability. You need only attend one of these dates before progressing to our ‘3 month basic’ course. 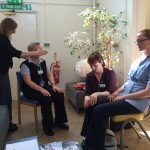 ‘3 month basic healer course’ (Essex) Level 1. 11th February, 11th March, 8th April 2017. This new monthly training course is designed for those who want to learn about a holistic way of life and basic Natural Healing skills. This will be the first time that this course has been presented by The Healing Foundation. It will give you a greater understanding of what Holistic Health is about and it is also the first step in becoming a registered THF Healer. This first three months of training covers all the basic healing skills including, learning a healing routine and learning about the Code of Conduct. If you have no previous healing experience you may still attend this course. Tutor – Jackie Barber, Principal of The Healing Foundation. Full Healer training course (Essex) Level 2 & 3. This is an 12 month training program which can be attended after completing the ‘3 month basic training’ course. Classes are held one Saturday per month in Essex. On completing this course, case-studies, counselling skills workshop and assignments you will become a Full Healer member of The Healing Foundation.